Last week was spring break for my kids and we had a lot of fun with little adventures and taking it easy at home! 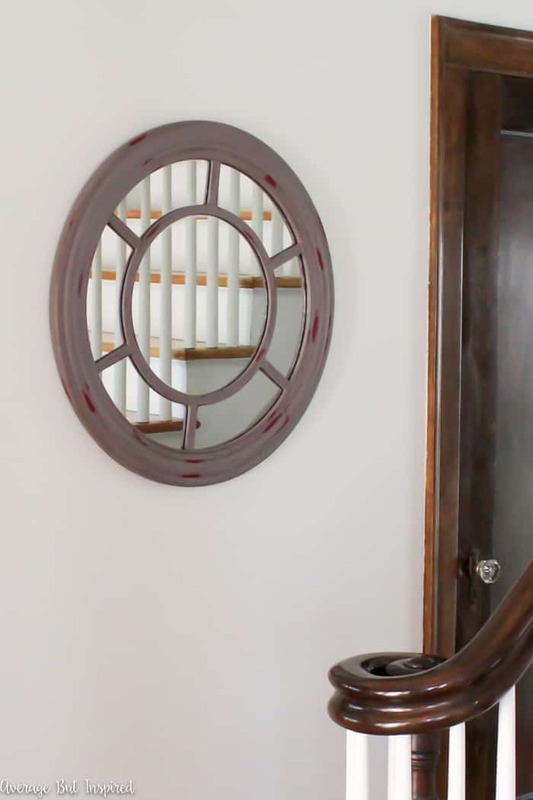 Being on more of a relaxed schedule gave me some extra time to get little projects done around the house, like repainting the mirror that hangs in my foyer. Here’s what it looked like, pre-paint job. I purchased that mirror right before my daughter (first child) was born – thinking that once she arrived I would never again have time to go to a store in my life. So I rushed into the purchase and bought the first thing I found to fill the wall. 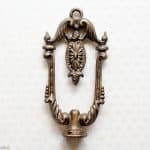 Needless to say, the faux silver finish wasn’t really doing it for me anymore (ever, really! 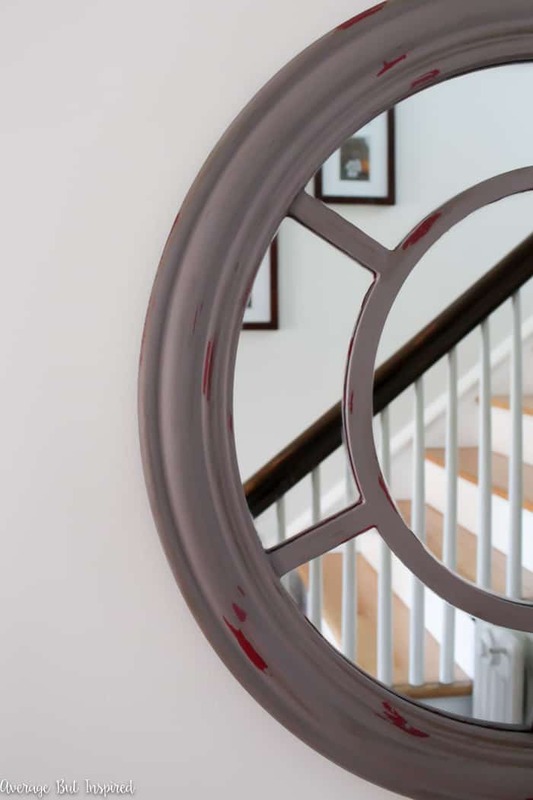 ), and with our foyer freshly repainted and new brass ceiling light on the way, I needed to give the mirror some pep! The problem was that I couldn’t get the mirror out of the mirror frame! I tried really hard but it just would not budge. Whoever made it did a great job with the glue. Having spent a lot of time trying to get the mirror out, I was invested at this point and ready to paint! So I figured out a SUPER EASY way to paint a mirror frame without removing the mirror, and I didn’t even damage the mirror in the process! You won’t believe this trick. 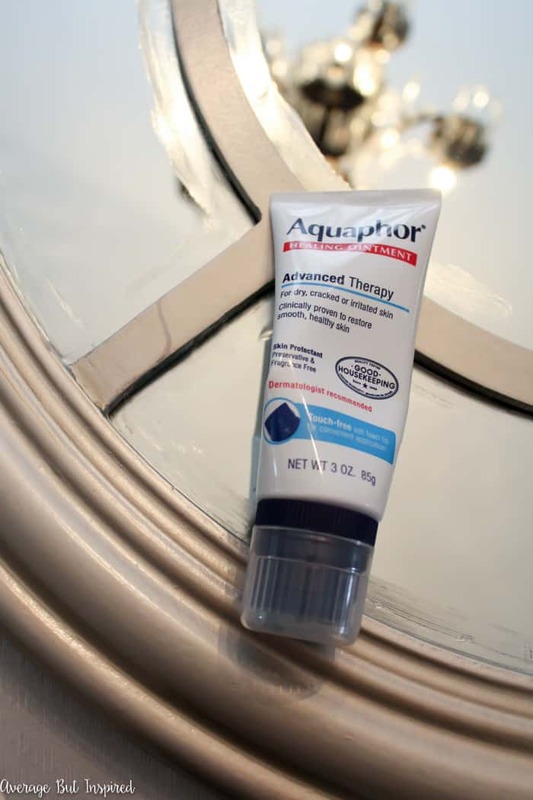 I rubbed Aquaphor all along the edges where the mirror met the mirror frame. See that nice line of Aquaphor all around the mirror? 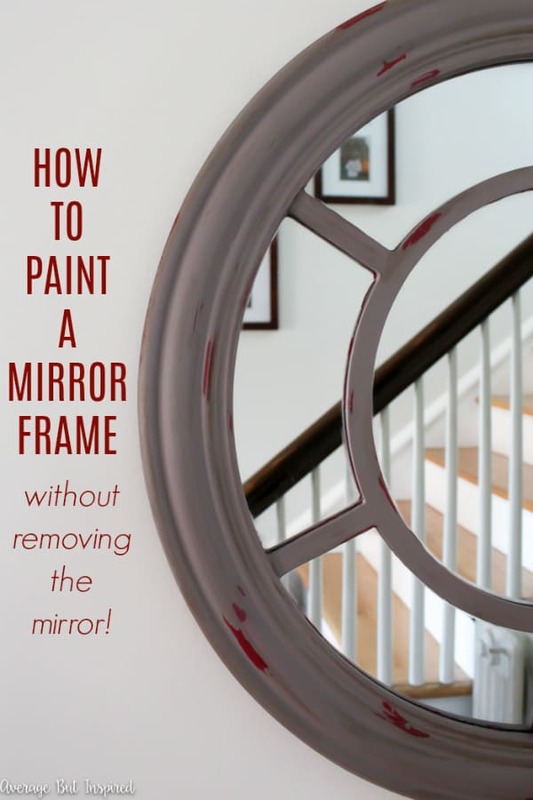 It saved me during this mirror painting project! 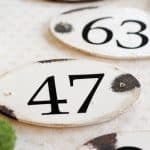 Now that you know the trick of how to paint a mirror frame without removing the mirror, let me show you how I repainted my mirror and another fun way I used Aquaphor in this project! 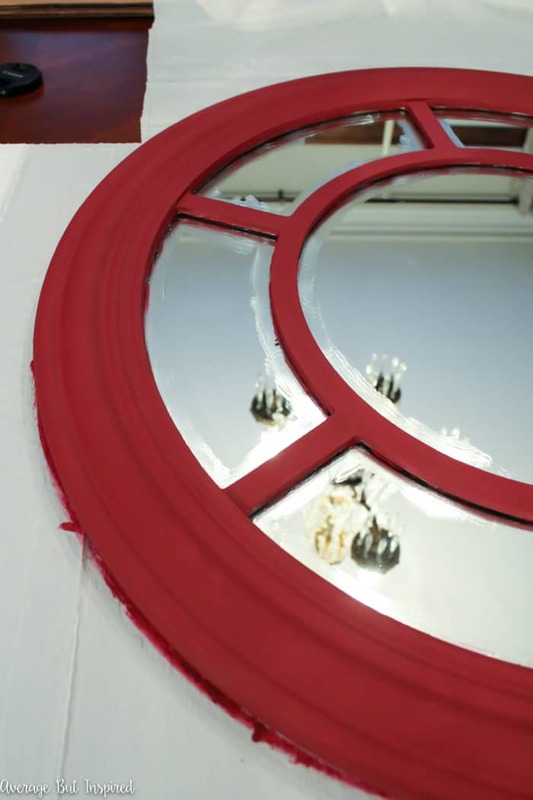 I started by painting the mirror with a red chalk paint. Notice that I got some paint on the mirror, but on the parts where the Aquaphor covered the glass. 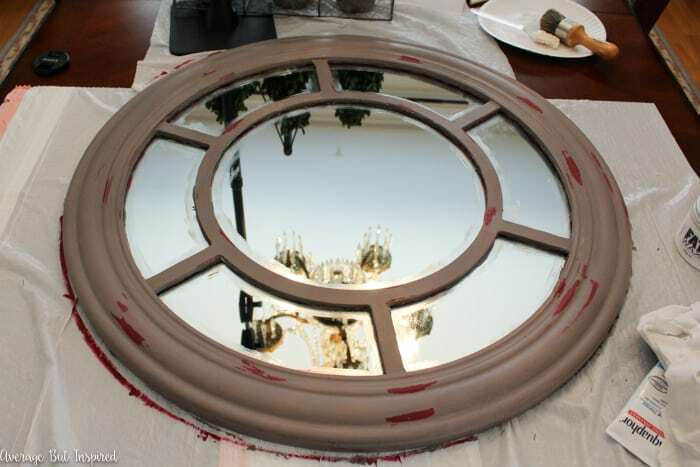 After that paint dried, I used Aquaphor to help create a distressed finish on the mirror frame. Watch this video to see just how easy it is to distress painted furniture with Aquaphor or Vaseline! 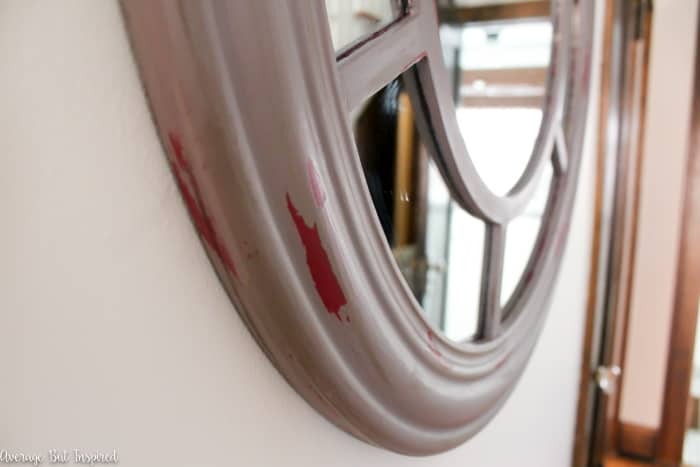 Although the section I distressed in the video isn’t very dramatic, you can definitely use Aquaphor or Vaseline to make the distressed areas more prominent, like on other parts of this mirror. After all the paint dried, I used a flat head screwdriver to gently remove any paint that made its way onto the mirror. It came up instantly because of the Aquaphor! I just wiped it up with a paper towel and then used glass cleaner to remove any residue. 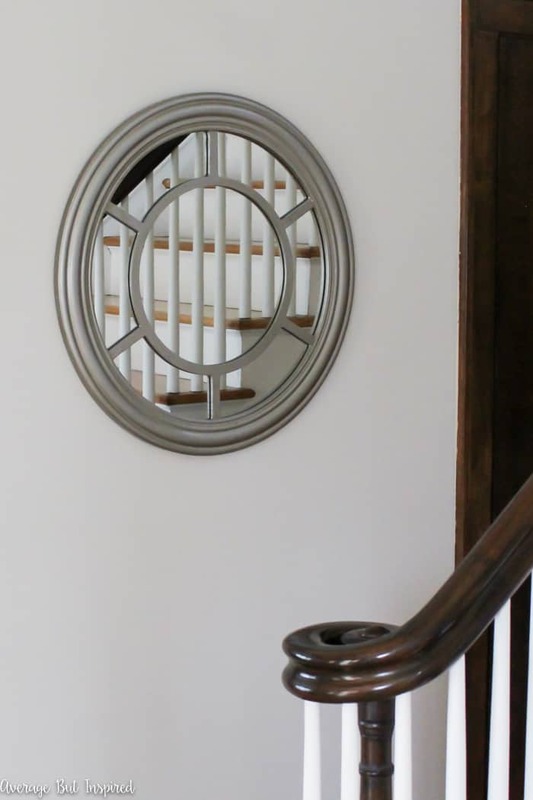 It was so easy to remove the metallic finish on this mirror and give it a new look. But hey, guess what? I’m not sure I like the new look so I may repaint again! Even though I’m undecided on the actual paint job, I can’t believe how easy it is to paint a mirror frame without removing the mirror! So, I’m not all that worried about repainting it if I still don’t love it after a month or so. What do you think? Do you like the two-tone distressed finish, or do you think it would look better as a solid color? Your mirror looks great the way you painted it. It certainly seems easy the way you painted it. I like the way mirror looks as is but love the top color and think it would look even better solid or with a different colr showing underneath with less distressing, I vote for solid in the top color. and think it would go better with what the other parts of your house that show in the photos. 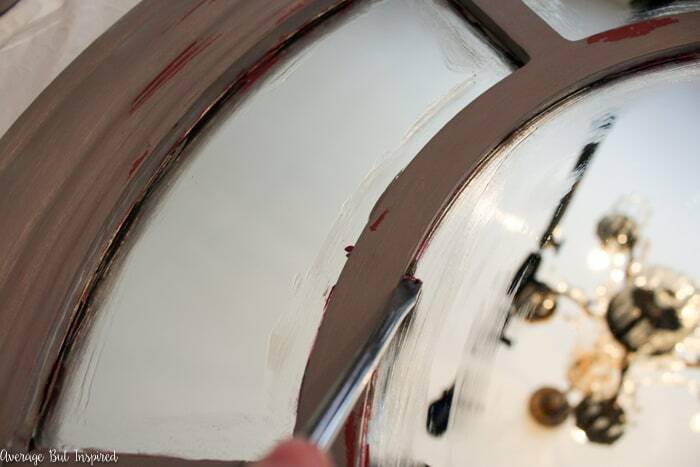 I love the tip on how to paint a mirror using Aquaphor. It’s brilliant! I like it but there is something off about it…I agree with you. 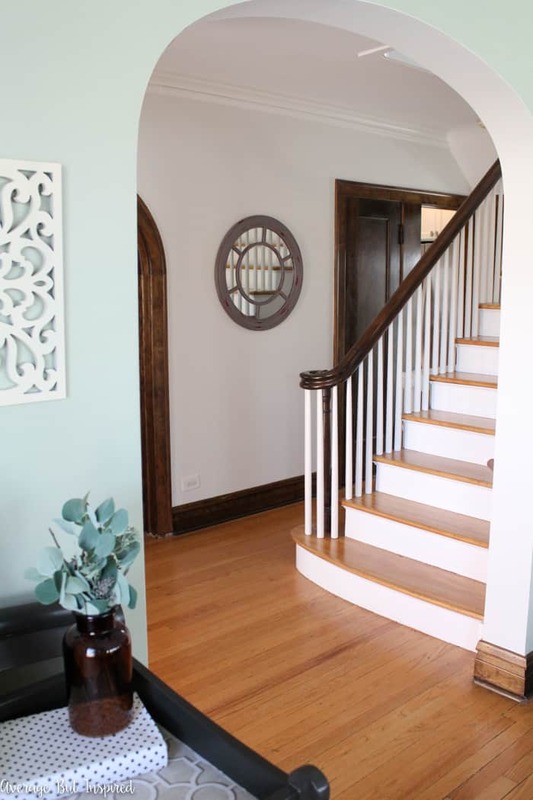 Perhaps you should try to match your colour of the flooring or banister in hallway? Distressing isn’t all that its cracked up to be. 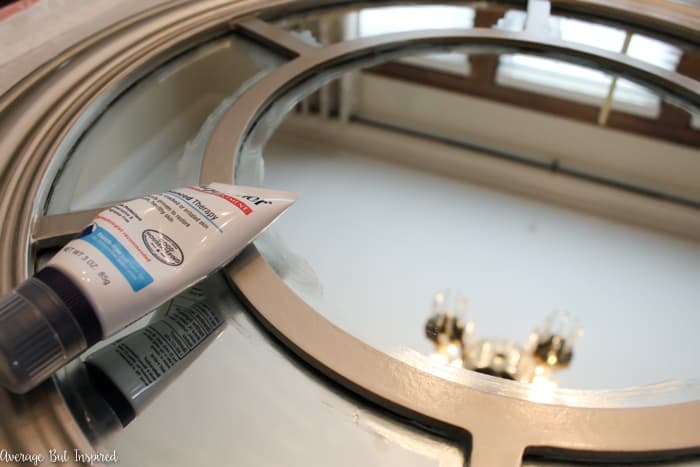 Loved the tip on how to save the mirror from getting paint on it by using Vaseline.